Drake J Hus – Hus is finally home. The Common Sense artist was sentenced to eight months in jail for carrying a knife back in December 2018. His re-introduction had been highly anticipated in the UK, with ‘Free J Hus’ among the most spoken about events in 2019, particularly in the last few weeks as rumours of his sentence ending grew stronger. On the fourth night of seven spent at the recently renamed ‘O3’ (O2) Arena as part of Drake’s ‘Assassination Vacation’ tour, Hus performed ‘Did You See’ to a lively crowd. Drake meanwhile has been active on the guest front during the UK most recent tour, after bringing out the likes of Section Boyz and Skepta last time round. Drizzy first pulled up at Fredo’s Manchester show and then brought out Dave and Fredo for a performance of ‘Funky Friday’ during the Manchester leg of the tour back on March 10, before bringing out Mist in Birmingham two weeks later. 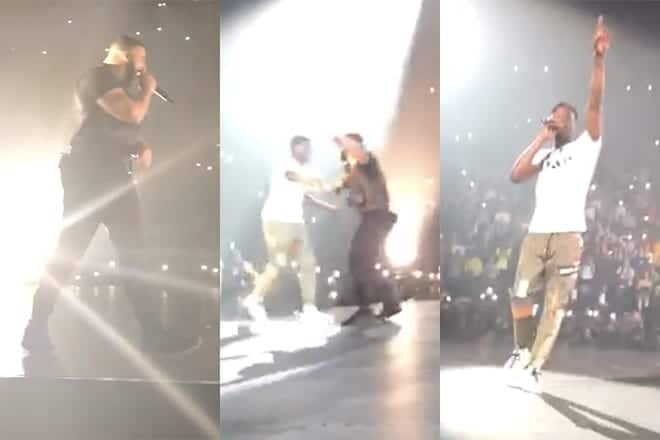 As his 22-date European tour headed towards the UK’s capital, Drake brought out DigDat and Unknown T for ‘AirForce’ and ‘Homerton B’ respectively. We then saw Afro B appear for ‘Joanna’, with Giggs regularly popping up for performances of ‘KMT’, Tiffany Calver on DJ duties, and now Hus. There are still three more London shows left, so it’s likely that Drake isn’t done bringing out special guests. It’s also likely that we are going to see some new music from Hus imminently.